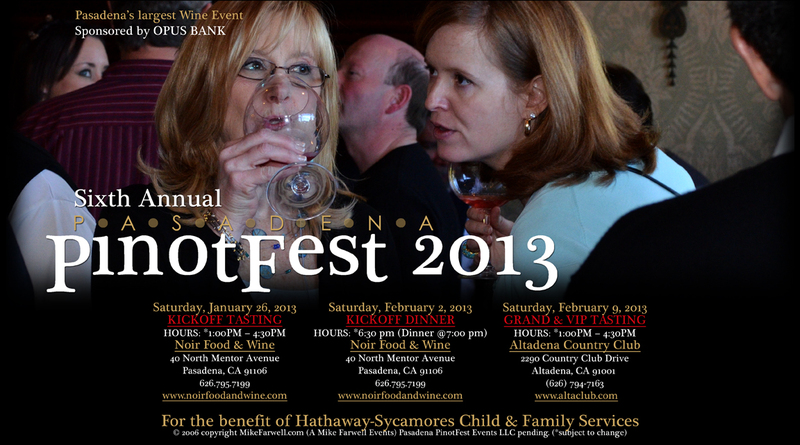 (PASADENA, Calif., Jan. 7, 2013)—The Sixth Annual Pasadena PinotFest—sponsored by Pasadena’s top-rated Noir Food & Wine—will be highlighted by a Grand Pinot Noir Tasting event on February 9th at the Altadena Town & Country Club, located at 2290 Country Club Drive in Altadena, California. Guests will have the opportunity to taste 200 pinot noirs from 100 leading California and Oregon wineries including: Alma Rosa, Ampelos, Arcadian, Badge, Cargasacchi, Carr, Clary Ranch, Clos Pepe, D’Alfonso-Curran, Dierberg, Dragonette, Dutton-Goldfield, Flying Goat, Fogline, Hitching Post, Ken Brown, Ketcham Estate, Landmark, La Fenetre, Loring Wine Company, Marimar Torres, Sojourn Cellars, Sierra Madre, Stephen Ross, Thorne, Zotovich Cellars, Cottonwood Canyon, Derby, George Wine, Gypsy Canyon, Prodigal and many more. Several of the showcased wines are exclusive to Pasadena PinotFest, and all featured wines are available for purchase at prices lower than most “tasting room” wines. Those in attendance also will be treated to top-notch noshing prepared by Noir Food & Wine and Altadena Town & Country Club. Tickets for the event—which runs from 1 p.m. to 4:30 p.m.—can be purchased online at http://www.pasadenapinotfest.com. Two levels of tickets are available: general admission for $89 and VIP admission for $119 (the latter comes with admittance to the event at 11:30 a.m. as well as access to the VIP lounge and celebrity sommelier host George Skorka). For additional information call (626) 795-7199 or email mike@mikefarwell.com.